A wide variety of adiabatically shock tested Manual & Actuated stop valves to EN ISO 7291 by both CTE and BAM, suitable for working pressures from zero up to 414 bag (6,000psi) are available. 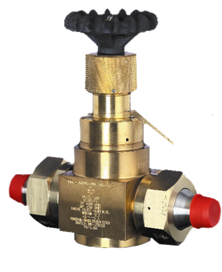 Most Hale Hamilton stop valves are fully pressure balanced and thus require a very small operating torque, even at the highest pressures. Series SV47, 60 & 130 area range of Manually actuated high presure stop valves available in 6, 12, 16 & 20mm orifice diameters, G1/4 to 2 5/16 -12 UNF port connections & cartridge mounted with operating pressures up to 420 bar and body materials of Nickel Aluminium Bronze & Brass. N Series are a range of fully Balanced, Manually actuated, high pressure stop valves available in 6, 11, 19 & 25mm orifice diameters, G1/4" to G1 1/2" threaded connections, welded inline and flange mounted with operating pressures to 414 bar, CV values from 0.8 to 11 and body materials of Nickel Aluminium Bronze & Brass.